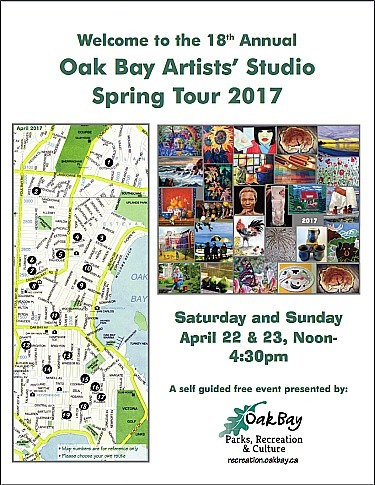 This year there are 26 local Artists in this self guided free event, Saturday and Sunday April 22 -23 2017 from noon - 4:30pm. The artists will be opening their home studios to the public showing paintings in watercolour, acrylic, oil as well as jewelry, art cards, ceramics, photograhy, paper castings, woodcuts and more. Come and walk, drive or ride your bike to locations shown on the map above. Meet the artists! Several of these artists have received nationwide and international recognition. 1. Victor Lotto - An award winning painter in acrylics and watercolour, Victor invites you to his studio to see his latest paintings from Canada and his travels overseas. 2. Pam Stonehouse - Pam explores trees, water, flowers, animals and the unexpected by foot, bike and canoe. Cards, prints, canvas and metal. 4. Claire Christinel - An award winning artist, Claire welcomes you to her studio! Enjoy her most recent vibrant landscpe paintings, in either oils or acrylics. Her art cards will also be available. 5. Anne Hansen - Anne is famour for her oystercatcher art. She is also fond of herons, bears, woodpeckers and bald eagles. 6. Linda Lindsay - Linda is known for her sensitively sculpted, and life-like terracotta and bronze figures. She is passionate about representing the best in humanity. 7. Jean Betts - Jean's textiles reflect her continuing studies in Japan. Handwoven silk scarves, linens and decorative pieces using handspun yams and natural dyes. 8. Myra Baynton - A selection of water colour and acrylic paintings that represent local and international settings. These works are inspired by the vibrancy of nature and travel. 9. Vivian Lochridge - Vivian's style is direct. Her brush strokes evoke a kind of synesthesia, the sound of colour. She explores, in oils, the balance and harmony of form. 10. Arlene Davey - In Chinese Brush Painting, the choice of subject matter, simplicity of composition and direct manner of execution bring life to this traditional medium. 11. Flo-Elle Watson - Using up-cycled white porcelain for her canvas; Flo-Elle creates an original one-of-a-kind, permanent, non toxic, and functional piece of art. Flo-Elle welcomes you, come and view her latest creations. 12. Bonnie-Anne Goodwin - Bonnie has collected antique and spiritual beads in her travels. She now is creating unique bracelets and necklaces. 13. Sandi Madsen - The studio is full of beautifully hand crafted pottery and silver jewellery. 14. Paul Redchurch - Once again, Paul is back with an eclectic mix of water-colours and acrylic paintings as well as his always popular greeting cards. 15. Robert Amos - Overflowing with creativity, Robert's studio is a must see. Paintings of Oak Bay, musings about James Joyce, books and prints and umbrellas. Don't miss it. 16. 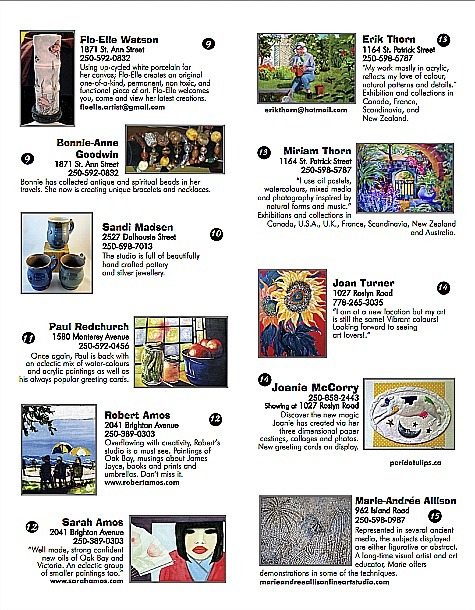 Sarah Amos - "Well made, strong confident new oils of Oak Bay and Victoria. 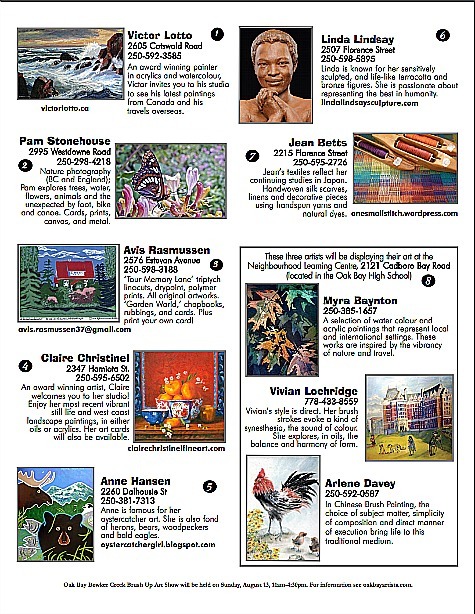 An eclectic group of smaller paintings too." 17. Erik Thorn - "My work mostly in acrylic, reflects my love of colour, natural patterns and details." Exhibition and collections in Canada, France, Scandinavia, and New Zealand. 18. Miriam Thorn - "I use oil pastels, watercolours, mixed media and photography inspired by natural forms and music." Exhibitions and collections in Canada, USA, UK, France, Scandinavia, New Zealand and Australia. 19. Joan Turner - "I am at a new location but my art is still the same! Vibrant Colours! Looking forward to seeing art lovers!." 20. Joanie McCorry - Discover the new magic Joanie has created via her three dimensional paper castings, collages and photos. New greeting cards on display. 21. Marie-Andree Allison - Represented in several ancient media, the subjects displayed are either figurative or abstract. A long-time visual artist and art educator, Marie offers demonstrations in some of the techniques. 22. F. Caroline Hunter - An award winning artist, Caroline welcomes you to her home to view her watercolour and acrylic paintings and cards. 23. Greg Stoneman - Greg is pleased to welcome you to his Jactone Studios to view his unique styles of multimedia woodart. 24. Val Woulters - "Shapes and colours I notice everyday inspire me to express the peace and joy of nature through the use of mixed media o canvas"
25. Bruce Vallance - Bruce continues to explore boat, figure and eclectic themes. His garden and renovated studio akes this a 'must see' visit. 26. Myrna Germaine-Brown - Myrna is creating larger works inspired by familiar subjects and surroundings using her painted and dyed fabric enhanced with pastels. Wishing you all a fabulous weekend and please stay tuned for more Oak Bay updates!